At Accorde Orthodontists, we believe everyone deserves a beautiful, healthy, unique smile to call their own no matter where they are in life. That's why we're proud to provide high-quality, convenient orthodontic treatments to patients of all ages throughout the Champlin, Rogers, and Maple Grove, MN areas. At our orthodontic practice, we strive to take an individualized approach to patient care, designing personalized treatment plans to perfectly suit each patient's unique needs and lifestyle. We are passionate about creating great smiles, and we believe it's true what they say – it's never too late for a beautiful smile. More and more adults are discovering the magic of orthodontic treatment, and there's little wonder why. Getting orthodontic treatment is an investment in your best asset – your smile – and you'll reap the rewards for years and years to come. In addition to functional benefits like healthier teeth that are easier to keep clean, getting a straighter smile imparts a boost of confidence, happiness, and self-esteem that's hard to find anywhere else, and many of our adult orthodontic patients tell us that they feel a positive impact in nearly every aspect of their personal and professional lives. Plus, getting a new smile has never been easier. Modern braces are thinner, more comfortable, and more aesthetically appealing than ever before, and treatment alternatives like Invisalign means no one even has to know you're straightening your teeth and the impact on your day-to-day life can be minimal. These days, getting a new smile is easy at any age! While we can move healthy teeth at any age, there are two things to keep in mind when undergoing orthodontic treatment as an adult. The first is that while we can move and realign the teeth, we can't make significant changes to the growth of the jaws in the same way we can with children – so for major issues in facial bone structure, orthodontic treatment may need to be used in concert with orthognathic surgery. Secondly, periodontal (gum) disease is a more significant concern for adults than for children. This means that prior to starting treatment, we'll need to treat any signs of gum disease, and you'll have to be particularly careful to maintain proper oral hygiene and watch for signs of gingivitis during your treatment. 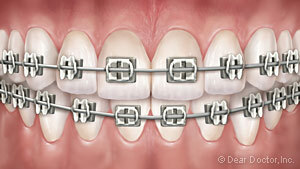 Traditional Metal Braces: This is what most people think of when they hear the word "braces." 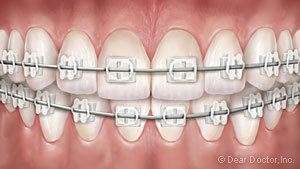 Composed of stainless steel wires and brackets, traditional braces offer a reliable, durable, and highly cost-effective way to treat nearly any orthodontic problem. Ceramic Braces:Ceramic braces work essentially the same way as clear braces, but instead of stainless steel, the brackets are made from a clear composite material that blends in with teeth. This means that clear braces have an undeniable aesthetic appeal, but they're also slightly more fragile and expensive than normal braces. Invisalign: If you're looking for an exciting alternative to braces, Invisalign gets rid of brackets, wires, and bands entirely. 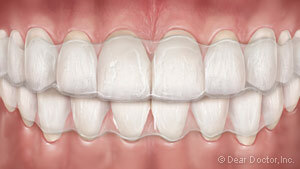 Instead, Invisalign uses a series of clear, removable plastic trays called aligners to straighten the teeth. The aligners are virtually invisible when worn and can be popped in and out to eat, drink, brush, or floss. This means that you can still enjoy your favorite foods, oral hygiene is a breeze, and almost no one will know you're straightening your teeth – so you don't have to worry about having braces for first dates, major presentations at work, or other important milestones. We know you'll be excited once you get your braces off, but your treatment doesn't end there. After the active phase of your treatment, you'll enter the retention phase, which is critical to the long-term health of your smile. You'll need to wear a retainer exactly as we specify – without a retainer, your teeth will just drift back to their old positions, erasing your hard work! We'll give you detailed instructions for wearing and caring of your retainer after we take your braces off. With conscientious care, you new smile will last you a lifetime! Orthodontics is truly an investment in your best asset – so why not make the investment? At Accorde Orthodontists, we're committed to helping you find an ideal, convenient treatment that works for your lifestyle, and we'll work with you through every step of the process. If you're ready to take charge of your appearance, your health, and your life, we encourage you to call us at 763-425-9888, reach out to us at our contact page , or use our easy online form to schedule an appointment at our Champlin , Rogers , or Maple Grove, MN office . We can't wait to hear from you, and we're looking forward to helping you achieve the smile of your dreams – no matter where you are in life!